Most dermal fillers restore volume and are slowly absorbed by the body. Radiesse® is no different, except it also promotes collagen production, leaving you with rejuvenation results for months to come. Dr. John Obi of Jacksonville Plastic Surgery offers Radiesse® and other cosmetic treatments to men and women in Jacksonville, St. Augustine, and Ponte Vedra Beach who would like to achieve a more youthful appearance. Radiesse® is a versatile dermal filler that can be used to restore volume in many areas of the face. 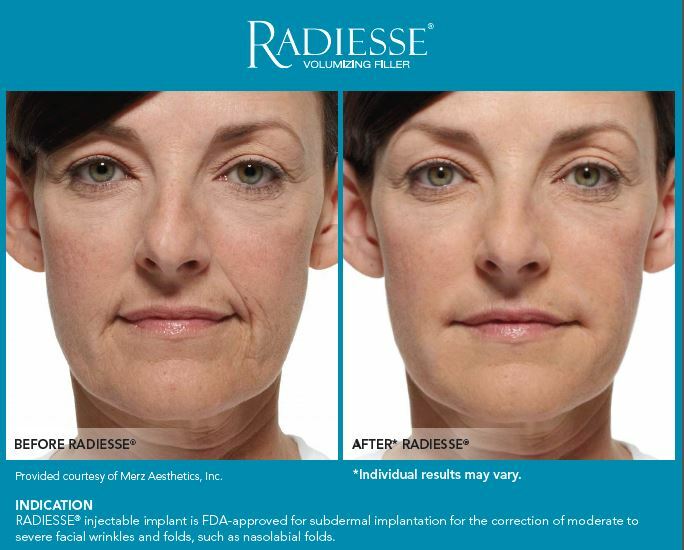 Radiesse® is unique in that it triggers collagen production in the skin, which results in long-term rejuvenation. This means that even after the lifting effects of Radiesse® have faded, you will still receive benefits from the increase of collagen in the body. What Happens During a Radiesse® Treatment? During your Radiesse® treatment, a fine needle will be used to make a number of injections into the desired treatment areas. *The injection process usually takes less than 30 minutes, but can take a bit longer if multiple areas are being treated at once. What Can I Expect After My Radiesse® Treatment? *After your treatment, you are free to resume your normal daily routine, as there is no downtime required for Radiesse®. However, you may be given special instructions to follow after treatment. *You may experience some mild tenderness or swelling around the injection site for about a day. *Results will be visible immediately after treatment and can last approximately one year. The cost of your Radiesse® treatment will depend on the number of injections performed, which depends on your treatment goals. Our complimentary aesthetic consultation is the first step toward achieving your goals, during which we will review all possible treatment options and their costs. We do everything possible to make our treatments affordable for our patients, including offering several payment options and financing through CareCredit®, Prosper Healthcare Lending or GreenSky™. Radiesse® is an effective dermal filler that can help patients achieve a boost of volume in the skin as well as long-term improvements to skin complexion and health. If you are considering this or any other cosmetic treatment, contact us today to learn more or schedule a complimentary aesthetic consultation. Jacksonville Plastic Surgery welcomes patients from Jacksonville, St. Augustine, Neptune Beach, and the neighboring Florida communities.